On November 16, 2013 - Sachin Ramesh Tendulkar played his last international cricket match against West-Indies at the at Wankhede Stadium, Mumbai. After the match he gave an emotional farewell speech. No one would be able forget the speech. The eyes of the gathered people were tearfull. Through out the speech Sachin thanked each and everyone who supported and encouraged him to build up his glorius career which spanned 24 years. Settle down let me talk, I will get more and more emotional . My life, between 22 yards for 24 years, it is hard to believe that that wonderful journey has come to an end, but I would like to take this opportunity to thank people who have played an important role in my life. Also, for the first time in my life I am carrying this list, to remember all the names in case I forget someone. I hope you understand. It's getting a little bit difficult to talk but I will manage. The most important person in my life, and I have missed him a lot since 1999 when he passed away, my father. Without his guidance, I don't think I would have been standing here in front of you. He gave me freedom at the age of 11, and told me that [I should] chase my dreams, but make sure you do not find shortcuts. The path might be difficult but don't give up, and I have simply followed his instructions. Above all, he told me to be a nice human being, which I will continue to do and try my best. Every time I have done something special [and] showed my bat, it was [for] my father. I know I have met so many guys who have fasted for me, prayed for me, done so much for me. Without that life wouldn't have been like this for me. I want to thank you from the bottom of my heart, and also say that time has flown by rather quickly, but the memories you have left with me will always be with me forever and ever, especially "Sachin, Sachin" which will reverberate in my ears till I stop breathing. Thank you very much. If I have missed out on saying something, I hope you understand. ....Goodbye. SACHIN TENDULKAR'S AUTOBIOGRAPHY "PLAYING IT MY WAY"
"I knew that if I agreed to write my story, I would have to be completely honest, as thats the way I have always played the game and that would mean talking about a number of things I have not addressed in public before. So here I am, at the end of my final innings, having taken that last walk back to the pavilion, ready to recount as many incidents as I can remember since first picking up a cricket bat as a child in Mumbai thirty-five years ago. So here I am, at the end of my final innings, having taken that last walk back to the pavilion, ready to recount as many incidents as I can remember since first picking up a cricket bat as a child in Mumbai thirty-five years ago"
Through his Tweet message , he said the Release date of his book will be November 6th 2014. 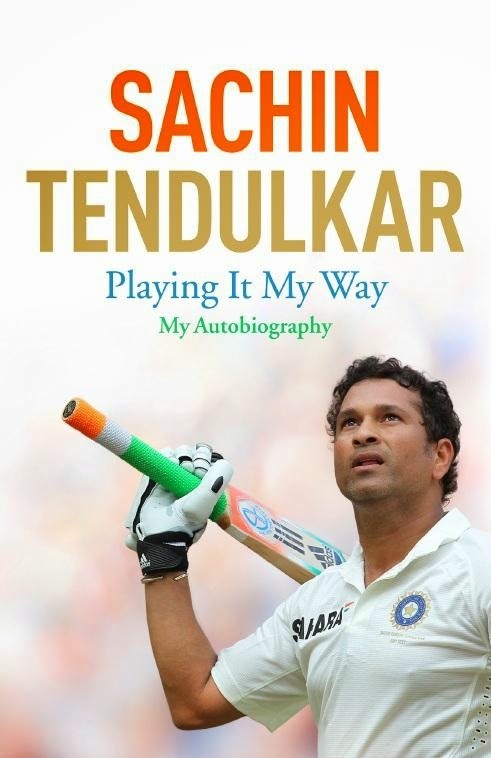 Read more about Sachin's Autobiography "PLAYING IT MY WAY"